Ledetu Ayalew on Berhanu Nega!!! Ato Ledetu Ayalew commenting on what he considers Berhanu Nega white lies. 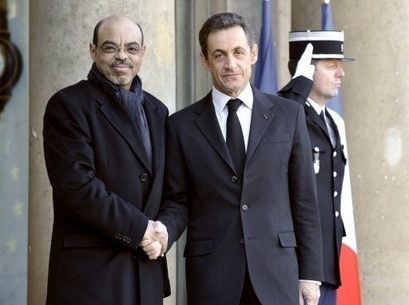 Ledetu goes to great length to unmask Berhanu Nega the person and Berhanu Nega the politician who is recruiting innocent Ethiopians to run his "hulegeb tigel" while he himself is living in the warmth of New York. This is a must listen, it is an eye opening! Why do people follow Berhanu Nega these days any way! Could it be because they do not know him? Replace Glen's America with Ethiopia in this narrative and you will understand why the CSO law was needed in Ethiopia! Forget about who Glen is for a moment and check this---Wouldn't you say the riots of election 2005, Human Right Watch's continuous attack on Ethiopia, the creation of the opposition TV station as well as Al Mariam's unfettered access to the Huffington Post to post any thing he likes to undermine the EPRDF government of Ethiopia are eerily similar to what Glen is saying? Every time we become aware how astute the EPRDF government is we become more emboldened and proud of our Woyane! The Executive Board of the International Monetary Fund (IMF) approved on November 12, 2010 the second and final review of Ethiopia�s economic performance under the 14-month arrangement under the high-access component of the Exogenous Shocks Facility (ESF). The approval will enable Ethiopia to draw SDR 40.11 million (about US$ 62.67 million), bringing total disbursements to the total available under the arrangement (SDR 153.755 million; about US$ 240.24 million). Somalia is now more at risk from terrorist attacks than Iraq, Pakistan, Afghanistan and Colombia according to a global ranking assessing the frequency and intensity of terrorist incidents in 196 countries. Sixteen countries are rated as �extreme risk� with Somalia (1), Pakistan (2), Iraq (3), Afghanistan (4), Palestinian Occupied Territory (5), Colombia (6), Thailand (7), Philippines (8), Yemen (9) and Russia (10) at the bottom of the ranking. 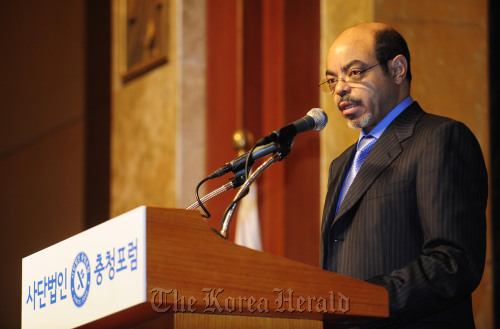 Addis Ababa, November 11, 2010 (WIC) - Ethiopian Prime Minister Meles Zenawi on Thursday called on South Korea to share its unique development experience with African countries to forge a �mutually beneficial partnership.� �One of the biggest gifts that Korea can give Africa is to share its development experience,� said the prime minister, 55, during his lecture in Seoul on the economic development of Africa and cooperation between Asian and African nations. Ahmed A. Moen Nov 10, 2010-I was watching Haile, Dirartu and Gebre, three Ethiopian athletes running the NY Marathon on Sunday, November 7, 2010. As always, I felt that the participation of Ethiopian Athletes are exemplary and indicative of the resilience of their characters and magnanimity under duress. Ethiopia�s first quarter export earning for the fiscal year 2010/11 (July 8, 2010 � July 7, 2011) increased 64 percent! (newsbusinessethiopia)-Ethiopia�s first quarter export earning for the fiscal year 2010/11 (July 8, 2010 � July 7, 2011) increased 64 percent as compared to the previous fiscal year first quarter. According to the data newbusinessethiopia.com received from the Ministry Trade, Ethiopia exported products worth 563.4 million US dollars during the first three months (July 8 � October 7, 2010) of the current fiscal) year.